I have seen large populations of Canada thistle this summer. It is a noxious weed in Illinois and in most states meaning that its control is required by law. 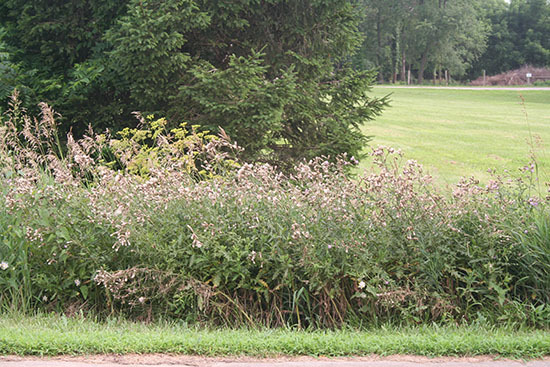 If Canada thistle is growing on land that you own or manage, you are required to control it. This applies to your neighbors as well and occasionally I am asked where a person can report said neighbors. Certainly, having a friendly discussion first with your neighbors is highly recommended. Go to their front door armed with information to let them know why this weed is such a problem and how it is spreading to your property. Take brownies or a cold beverage perhaps. Take an understanding attitude and maybe even a willingness to help them. If after meeting reporting is indeed necessary, you can contact your local county board. Some counties will have a "thistle commissioner" or similar position. Some won't have a designated weed person, however, the enforcement authority lies at the county level. There are differences from county to county. Some strictly enforce this law and others have other higher priorities. Unfortunately, counties were handed this role without strong funding to support the effort. The county will then issue a warning letter to the responsible party requiring control of Canada thistle. If control does not occur, then the county will have them controlled and the landowner will be responsible for any associated costs. Fines can be issued as well. Previously, I wrote about Canada thistle identification and control. The article can be accessed at: http://hyg.ipm.illinois.edu/article.php?id=73.